Winter is coming and so is a recession. I am not trying to alarm you but trying to warn you, another recession is coming. We got some positive news that the GDP for the quarter grew by over 4%. The President is sure to use this news to try to further his agenda. Unemployment is down, gas prices are low, the stock market is up, and housing prices are going up. All great signs for the country! However, wages are low, tariffs are higher, health care prices continue to rise, and less and less people are prepared for the jobs for tomorrow. Total household debt hit a record $13 Trillion in 2017 which is even higher than the levels seen right before the Great Recession. Our government continues to allow our national debt to rise. The President has now decided to go to war with trade against our allies and enemies. Unlike the last recession, prices will continue to go up while wages will go down or stay the same. Inflation will continue to grow, and we will all suffer. The government will not be able to bail us out this time. 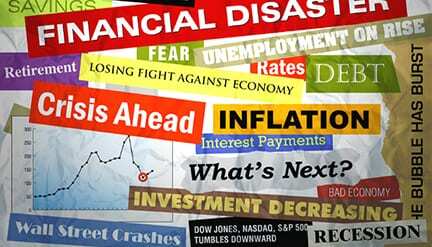 According to economist Peter Schiff, the next recession will see interest rates go up while the inflation rate will go up to 5%-8%. The fed will not be able to stimulate the economy. At the same time, the government will have to raise taxes, which means no one wins. The government will continue to print the dollar and try to make things look good for as long as they can. However, that will only go so far. As prices rise, what are you going to do without? Cable? Medicine? Food? Who will be hurt worse? People of color, the poor and the elderly. Are you ready? If you haven’t already, you must begin to make smart purchases, pay off debt and stop wasting your money. Schiff recommends we should invest in gold. If you purchase jewelry, and you try to sell it, you may get .10 on the dollar if you are lucky. I am talking about purchasing and investing in gold on the stock market. Gold has always been the choice commodity. It is used in cell phones, computers and health care. You can do things with gold that you cannot do with other medals. The properties of gold are properties no other medal can duplicate. Some recommend you purchase gold bullion or coins and store them away. You may also wish to purchase gold through an online brokerage account. However, costs are lower if you own physical metal directly. I recommend you do something to get prepared for winter now. The next recession will be worse and will take longer to recover from. Make no mistake, winter is coming and we all need to be prepared.